We are committed to helping people in our community learn about nutritious food choices, and how to stay healthy on a limited food budget. The Food Bank’s commitment to ending hunger in our region includes a belief that knowledge is power for the families in need. 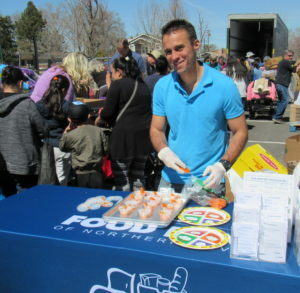 The Nutrition Education program at the Food Bank of Northern Nevada teaches adults and children about nutritious food choices, simple food preparation, safe food handling, getting the most nutrition with a limited food budget and increasing physical activity for healthy living. The program includes a Train the Trainer Food Smarts option where program organizers can be furnished with a six lesson course for children to learn about nutrition. Also offered is Smart Shopper, a class for adults on making the most from their food budget, and Nutrition on Wheels, that offers nutrition tips, recipes, and even samples right at Mobile Pantry sites. This fall, the Food Bank is offering a free nutrition class series for seniors called Seniors Eating Well. There will be food samples and/or a raffle prize each week for those in attendance. Attendees do not need to pre-register and additional questions about the classes can be directed to Mike Escobar at 775-331-3663 ext. 134. For more information about the Food Bank’s Nutrition Education programs, please contact Director of Programs & Community Engagement, Jenny Yeager, at (775) 331-3663 ext 108. The Food Bank proudly supports Produce for Better Health Foundation’s Fruits & Veggies-More Matters initiative.